This morning Canonbie Church welcomed the Reverend Adam Dillon from Moffat, who conducted communion and the christening of Sam William Ellwood. 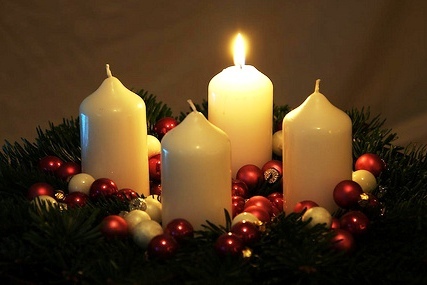 It is also the first Sunday in Advent, which was the theme of Adam’s sermon: Advent is God’s time. He went on to talk about what kind of language we use when referring to time. Although we all experience time equally, there are those with not enough time and those with too much time, the time poor and the time rich, the powerful or the powerless. The powerful view time as something they can control as they would a commodity, buying and spending time, quality time, investing time, putting time aside, time is money. Whereas the powerless have an abundance of time, more supply than demand, they waste time, have time on their hands, kill time. However, God is the one who gives us time, and it is His. If time is our friend then we can use it to make the world a better place, we can use time to spend time with the people around us, both friends and family, and also those we might find more challenging. God gives us the opportunity to discover that we have nothing to fear. So this Advent remember this, God has given us time, so that we can use it for His good.